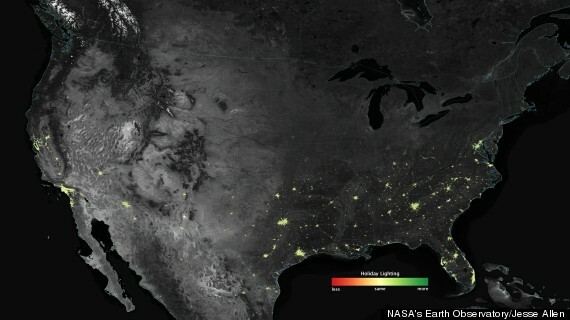 NASA reports that satellite images show certain cities shine between 20 percent and 30 percent brighter during the holiday season. And out in the suburbs, some areas shine as much as 50 percent brighter. In the above map, the green dots represent areas where lights are up to 50 percent brighter in December. “Overall, we see less light increases in the dense urban centers, compared to the suburbs and small towns where you have more yard space and single-family homes,” Eleanor Stokes, a NASA Jenkins Graduate Fellow and co-leader of the study, said in the news release. The measurements were taken by the NOAA/NASA Suomi National Polar-orbiting Partnership (Suomi NPP) satellite over three years. The effect isn’t limited to the U.S. during Christmas. In fact, the researchers first noticed the difference in light levels in images of Cairo taken during the Muslim holiday of Ramadan.